Following a 4-1 week, KLWN’s Sean Levine has pushed his lead to two games in the overall picks standings with a 24-11 record. 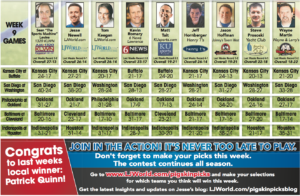 KUsports.com’s Jesse Newell and Tom Keegan and Henry T’s Jeff Hornberger remain two games back at 22-13. 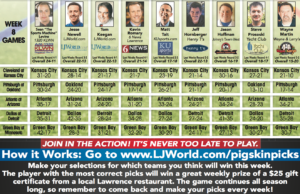 All nine of our panelists are sticking with red-hot Kansas City, with each of them predicting the Chiefs will move to 8-0 with a home victory over the Cleveland Browns. 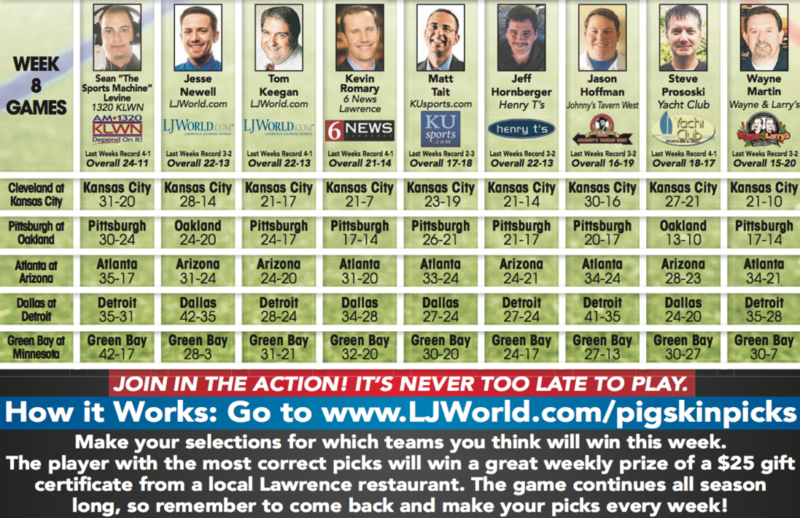 Remember, you are invited to pick the games along with us at ljworld.com/pigskinpicks. 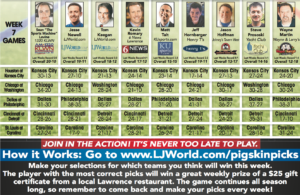 Congrats to Patrick Quinn, who went 13-2 last week to win a $25 gift certificate from Wayne and Larry’s. A reminder: The Carolina Panthers and Tampa Bay Buccaneers play tonight, so get those picks in quickly to be eligible for this week. 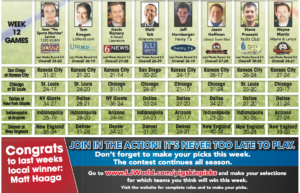 Our full Week 8 picks are below (click to enlarge).